The crowd-pleasing screwball comedy meets slasher spoof GARDEN PARTY MASSACRE will hit the market later this year via SGL Entertainment. This is the second film from writer/director Gregory Blair and the second collaboration with SGL Entertainment. Blair’s award-winning, slow-burn psychological thriller DEADLY REVISIONS was also released by SGL Entertainment. GARDEN PARTY MASSACRE is a fast-paced, wacky spoof in the vein of Shaun of the Dead and Tucker and Dale vs. Evil. The fun begins when a friendly backyard gathering goes hilariously awry as an unexpected guest arrives - with a pickaxe and an attitude! The film has won a dozen awards on the festival circuit. Awards include: “Best Feature” (FANtastic Horror Film Festival), “Outstanding Horror Comedy” (Zed Fest Film Festival), “Best Film” (Lucky Strike Film Festival), “Outstanding Horror/Comedy Feature” (Los Angeles Academy of Film Awards), “Best Narrative Feature: Comedy” (Hollywood Independent Filmmaker Award) and “Best Comedy” (Artists and Aliens Film Festival). 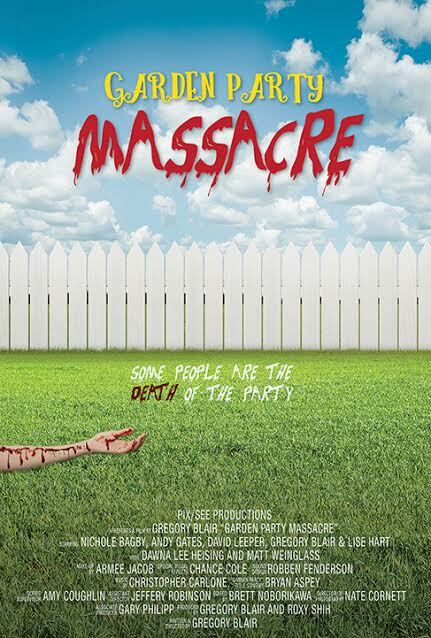 GARDEN PARTY MASSACRE has appeared in several film festivals, throughout 2017. GARDEN PARTY MASSACRE’s lead cast has already earned three “Best Ensemble” awards. The awards included cast members: Andy Gates (“Grimm”), Nichole Bagby (On The Rocks), Lise Hart (Deadly Revisions), Gregory Blair (Escape The Night), Dawna Lee Heising (Samurai Cop 2: Deadly Vengeance), Matt Weinglass (“Jimmy Kimmel Live!”) and David Leeper. GARDEN PARTY MASSACRE is a PIX/SEE Productions’ film. This title will be released only on Blu-ray, DVD and Digital platforms in late 2018. The film will be available on the following platforms: Comcast, Hulu, iTunes, Amazon Prime, Google Play and more very soon.